Lacquer Lockdown: Indie Polish Haul Bottle Spam + Ebay finds! Man there are a lot of great indie brands out there and more coming every day. However, it can be a bit overwhelming - polishes in limited supply due to hard to attain base for polishes as well as glitters and pigments, limited staffing/personal time, long wait lists, and stalking stalking stalking. It can be exhausting and annoying, but it can also be extremely rewarding when you finally get your hands on a hard earned lemming. I mean - I'm still dying inside for some Nailventurous and Dollish polish and a few others but I know when I get them it'll be worth the wait. My recent haul includes some real beauties too as well as a few Ebay finds so let's get this post rocking! I recently posted about the my incendiary lust for CTD especially when combined with deep bloody red glitter - which is exactly what Toro for me was (see post here). In any event I also took the opportunity to grab up some Mastermind and Mrs. White with a couple more awesome polishes on my radar. Jaime, the creator behind this brand, has some beautiful packaging and the polishes come in a lovely organza gift bag packaged in silver confetti wrap - classy. 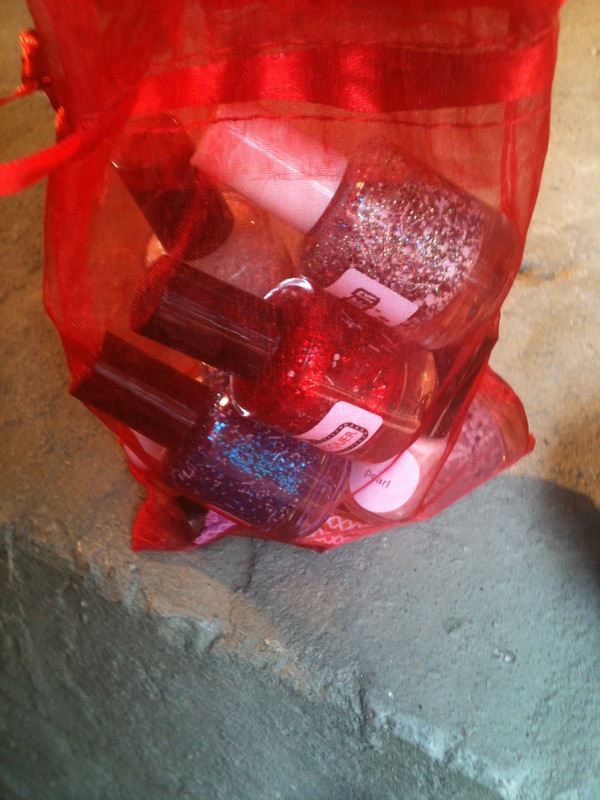 Best yet these polishes are packed with glitter and have easy spreadability. I haven't struggled to get the glitter fully mixed with the base as I have some other brands. Overall this brand's a winner. Check her out on her Etsy store here for more great polishes - just leave some for rest the of us! Damn damn damn! I don't have words for this brand. I literally got knocked speechless. Karen and Lexi of LL have so many great polishes it will make your head spin! Endless combinations of glitter and shimmer enough to spark any lacquerista's imagination. Certainly, they grabbed my attention with some of their wonderful creations. I picked up two great polishes Salt N Peppa and Party Rockin'. I haven't done any swatches yet, but stay tuned. They are both insanely dense glitters with moderate to easy spreadability and no settling issues here! I have great plans for Party Rockin' and Salt n' Peppa is an instant winner. You can find these polishes and more here on Etsy. This creator is sweet with excellent communication. I ordered two polishes from her and there was a mix-up with inventory. She noticed immediately and sent me an alternate plus two smaller samples one of which I was really lemming. I have to say that good customer service and communication goes a long way with me and this creator has both. However, a couple things drove me crazy in a not so good way. First, one of the polishes I got sent looks completely different from the photo's posted in the shop. I mean it's entirely 5-6 shades darker than the listing. Second, the glitters in these polishes seem to settle and I mean settle heavily making application frustrating and more than a bit annoying. Applying Jade I would shake until everything was mixed up. The instant I stopped shaking glitters were settling deep into the bottom of the bottle and unfortunately the color began separating too - not fun! I'm still on the fence about these polishes and I'll have to try out a few more before casting a final decision. It is worth saying though that she has some truly beautiful neutral shades in her range which is unique for indie glitters. Find more polishes and info here on Etsy. I found these cute little plate while searching around on the 'bay for something oh so Hello Kitty cute! These fauxnad plates are adorable KD01 and KD03. 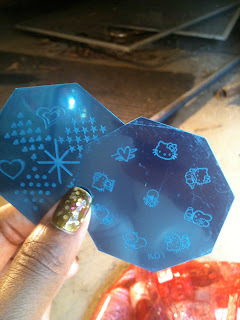 I can't wait to do something fun with these check out the cute little bunny kitty on KD01! Thanks for reading and please let me know if you've also found some cool indie companies or products that you're trying out!